In the Standard Security Blyth and Wansbeck Sunday League SA Randolph Cup, Red Lion Earsdon and Ashington Station Lounge went all the way to extra time. Red Lion were 4-1 up at half-time with Mitch Rennie scoring a hat-trick and Andrew Smith also on target. But Station Lounge came fighting back and forced extra time with goals from Damien Stevens’s hat-trick and Colin McLellend. But goals from Rennie, Charlie Thompson and Nicky Thomson put Red Lion into the semi-finals. In round one of the Eric Anderson Cup, Ashington Sporting Club lost 1-0 at home to a Robert Wilkinson goal for Guide Post Social Club. 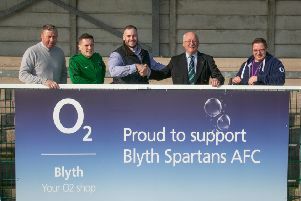 In a quarter-final tie, Blyth United Services lost 3-2 at home against Red Lion Bedlington. Stephen Hardy and David Long scored for Services, but goals from Jordan Cuthbertson, Alex Martin and Craig Webb put Red Lion through. In round two of the Alan Davison Cup, Whitehouse were at thumped at home by Spring Gardens. Kevin Orkney scored a consolation for Whitehouse while John Amos (4), Steven Goicoechea (3), Stephen Foster (3) and Tony Lucas found the target for Gardens. In the quarter-final Burradon and New Fordley eased their way into the last four with a 6-1 home win against High Street. Chris Laidlaw scored for Street while Scott Pocklington, Andrew Keenan, Dale Pearson, Kieran Pyle, Paul Alexander and Steve Howes scored for the winners. In the premier division, Broomhill North End Trap lost 5-2 at home against Blyth Waterlooo Pub. Daniel Palmer scored both for the Trap, but strikes from Martyn Hepple (3), Steven Craig and Kevin Long secured the win. Marden Residents won 3-0 at FC Beacon in division one with goals from Marc Hunter, Leeroy Odd and Chris Ridgeway. The NFA Sunday Minor Cup-tie between Heaton Meadowfield and Ashington Station Lounge was called off in midweek. The tie will be played on Sunday with a 10.30am start.